The AEA Technology VIA Analyzer is one of our Factory New 100 kHz to 54 MHz SWR Meters with Complex Impedance. o Windows™ VIA Director Software available. o Supertwist 64x128 LCD Display. o Nonvolatile memories for Plot Storage. o Signal Generator Mode - CW signal generator. o Multiple combinations of data display window types. o Multi-line grid available on-screen for easy viewing. o High resolution plot display on PC. o Automatic calculation of minimum SWR Point (value and Frequency). o Reactance (X) magnitude verses Center Frequency. o Automatic and Manually Adjustable plot scales. o Auditory cues for non-visual tuning. 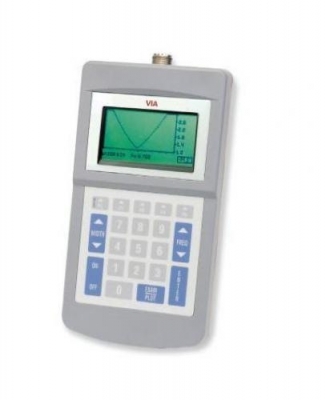 The VIA Analyzer is a handheld, enhanced capability SWR Analyzer used for tuning antennas and antenna circuits. The Analyzer has the capability of providing accurate measurements and sweep displays of SWR, Return Loss, Impedance, and resistance. It also provides a reference to the Magnitude of X and Phase Angle. The VIA 's testing functionality, combined with its 100 kHz to 54 MHz frequency range, make it a versatile tool for many antenna service applications as well as the understanding of complex tuning issues. The optional VIA Director Software application provides the user with the capability of remotely operating the VIA through a serial port connection while viewing high definition results on a P.C. The software makes the printing and storage, of documentation and reports easy.